This is my 100th post here on Life on Olive Street. Five months in and I’m glad I made it this far. It’s a fun way to keep everyone updated about our family, and I like posting and photographing recipes I try. So while I’m fairly sure that only about 12 people actually read this blog, it’s a lot of fun on my end to document some of our daily life and share our adventures. Some unexpected things turn out to be the most popular. For example, the top post on here is Happy Father’s Day in which Hannah had a meltdown over crushed Oreos. It is also the most commented-on post. It was a moment that Brett and I could have laughed over for a while ourselves, but since I grabbed the camera and published it in the blogosphere, we got to share it and hopefully bring a smile to a lot of other people. So, thanks for reading! Here’s to the next 100. And stay tuned for a new look. 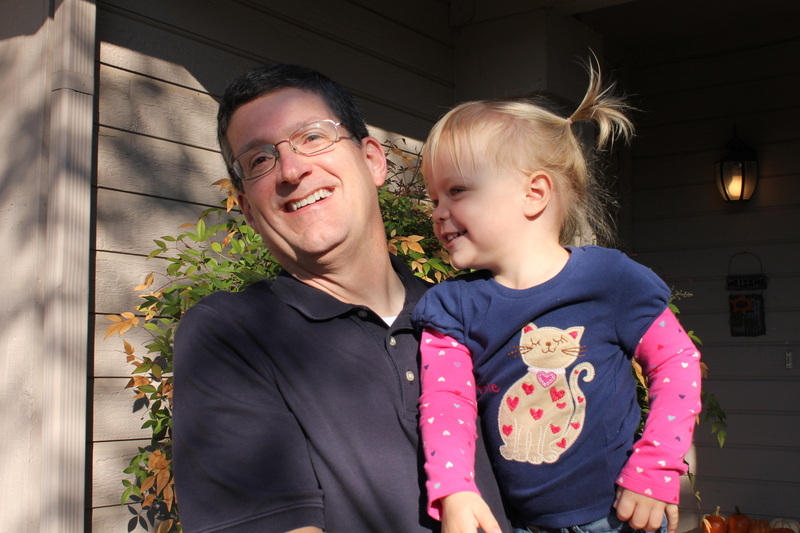 Hannah had a blast with her Grandpa Dean for the last few days. It was fun from the moment he pulled up in his turquoise Nissan Cube rental car. 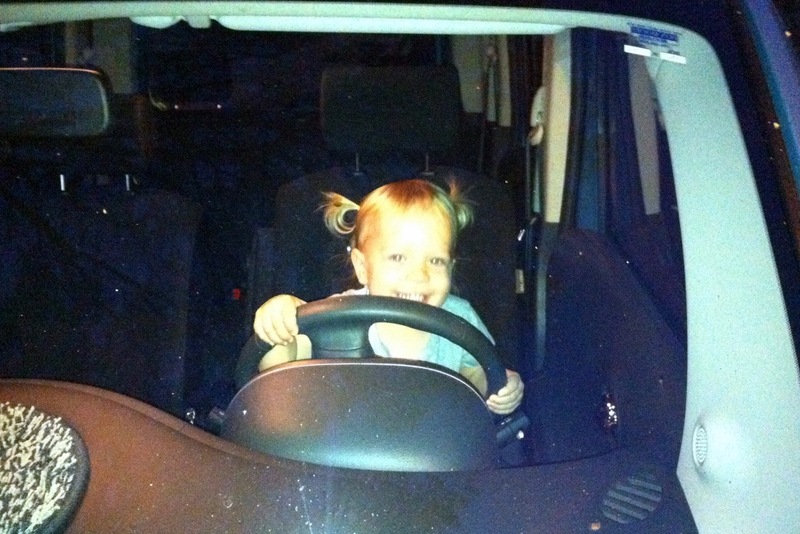 Every day, Hannah begged to go drive it. My dad tackled some of the household projects we’ve had on the to-do list, and we ate out at some of our favorite spots like Torchy’s Tacos and Moonshine. We also went to Hannah’s favorite spot, Chick-fil-A. We went to the Nature Center, ran fun errands together and wrapped up the time with a Fall Festival at the church where Hannah goes to preschool. 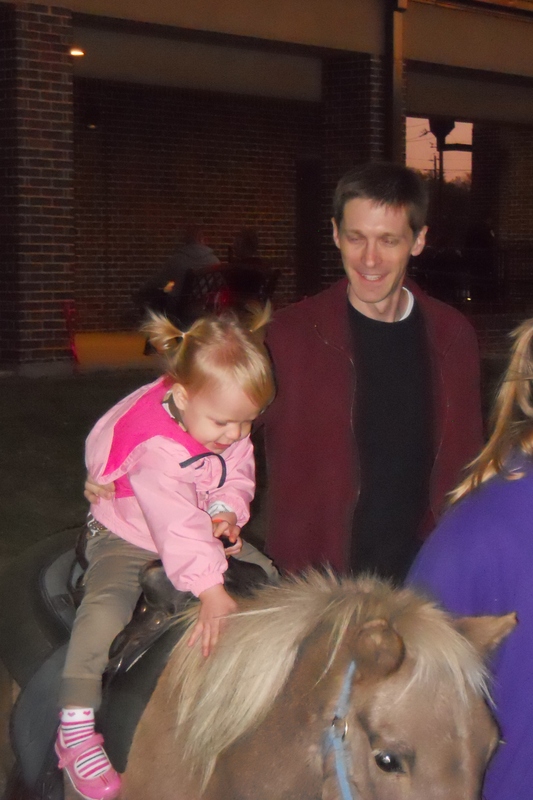 The highlight of the festival was definitely the pony rides. I got in a rut with snack time. Mostly, I was rotating goldfish, raisins and some form of dry cereal. Sometimes, I’d get really crazy and combine all three in a sort of party mix. Then my friend Meghan showed me how make popcorn, and we are big fans of how cheap, easy and healthy it is. We often have popcorn parties when we get together. Cheap – I buy organic popcorn kernels from the bulk bins for super cheap, and even just a pound ($1.69) can last a long time. A bag of microwave popcorn (nonorganic) runs around 54 cents, but I can make the same amount for 33 cents. That’s over a 40% savings. 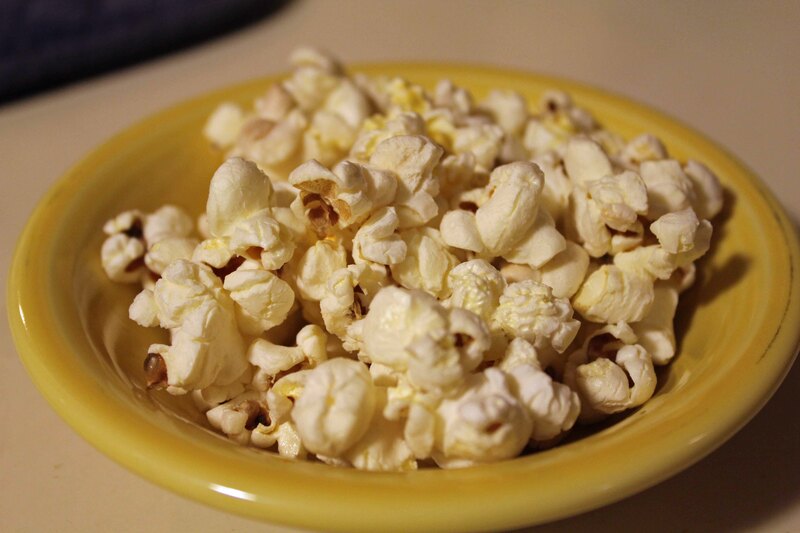 Easy – Once I got the process down, it only takes me six minutes and not much effort to have popcorn in our bowls. Healthy – Popcorn is a whole grain, and has fiber, protein and antioxidants. By making it myself instead of using a microwave bag, I’m saving a lot of fat and calories and skipping ingredients like hydrogenated oils, artificial flavorings and too much salt. And by buying organic, I’m avoiding GMO corn. And did I mention it’s just fun? Hannah loves to help listen for the pops. She and Cody can put down a lot of popcorn. We usually just make it with a little salt, no butter. Put oil in a large pot over medium heat. Add four kernels to oil. When all four kernels have popped, you know the oil is a good temperature. Add the rest of the kernels and some salt if desired. Put the lid on the pot and shake vigorously (holding lid on) so that kernels are coated evenly in oil. Put back on heat. Shake every 10-15 seconds to keep kernels from burning. When pops have slowed to 1 every 5 seconds, turn off heat. Add melted butter if desired and shake again. Ready to eat! 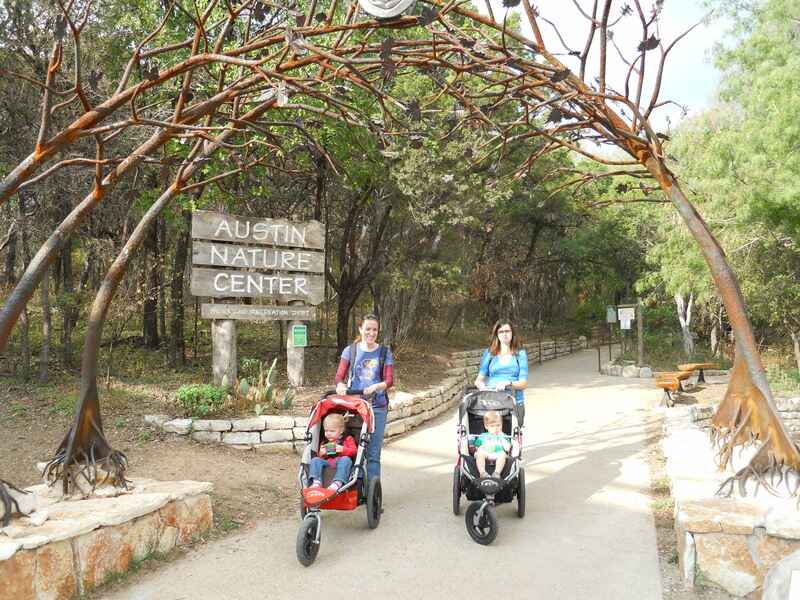 I recently got a recommendation for the Austin Nature and Science Center, and since my dad is visiting this week, I thought it would be a good time to check it out. We got there a little early and took a stroll down to Lady Bird Lake where Hannah wanted to chase all the strollers, pet all the dogs, run in front of bicycles and jump in the lake. 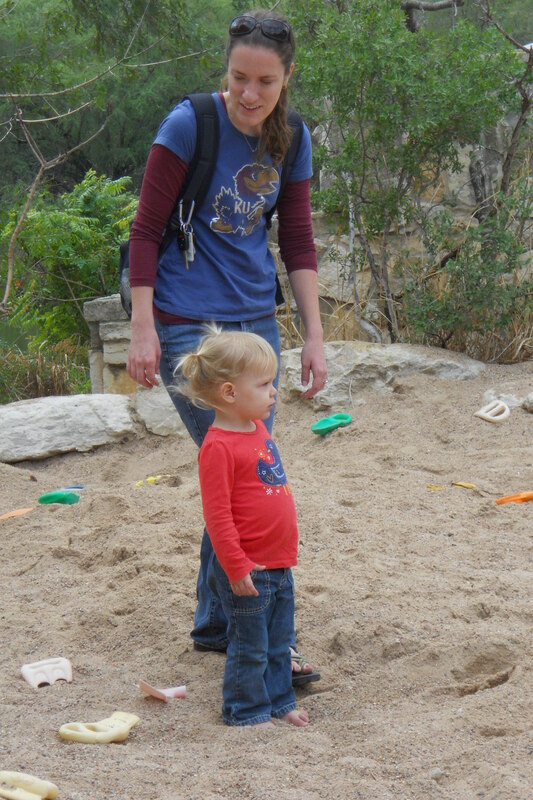 Meghan and Cody met us there, so we loaded up the Bobs and headed up the switchbacks to the Nature Center entrance. 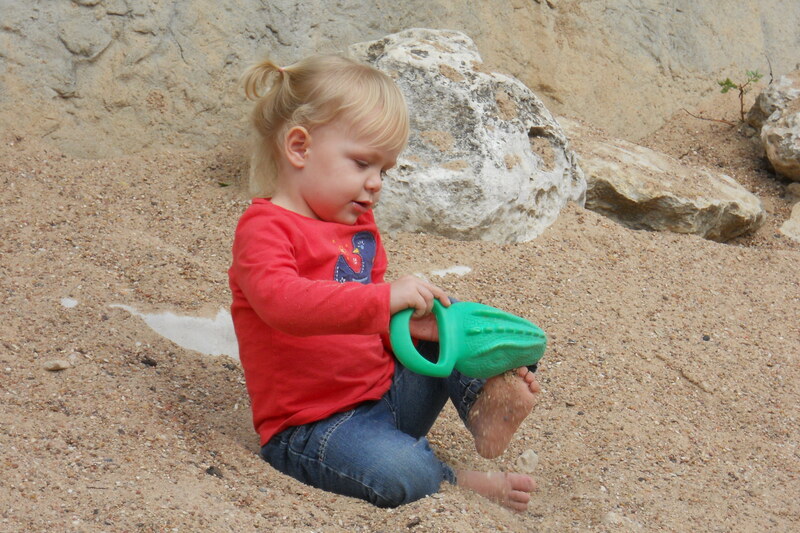 We were glad for the strollers because it was a fair distance and would have taken a long time for little legs. The inside of the Nature Center has a hands-on room with skulls, feathers, rocks, bones, horns, turtle shells and fur. The two-year-olds didn’t think this was very interesting. Outside, there were animals that are native to Central Texas. Nothing exotic but a good up-close look at regional wildlife – bobcat, coyote, foxes, skunk, etc. There was also a building with local reptiles and amphibians. The fish and turtles were the biggest hits with the kids. Back outside, we went through the “Bird of Prey” area which had a few hawks and owls. There were four species of owls which I think is more than you usually see at a zoo. 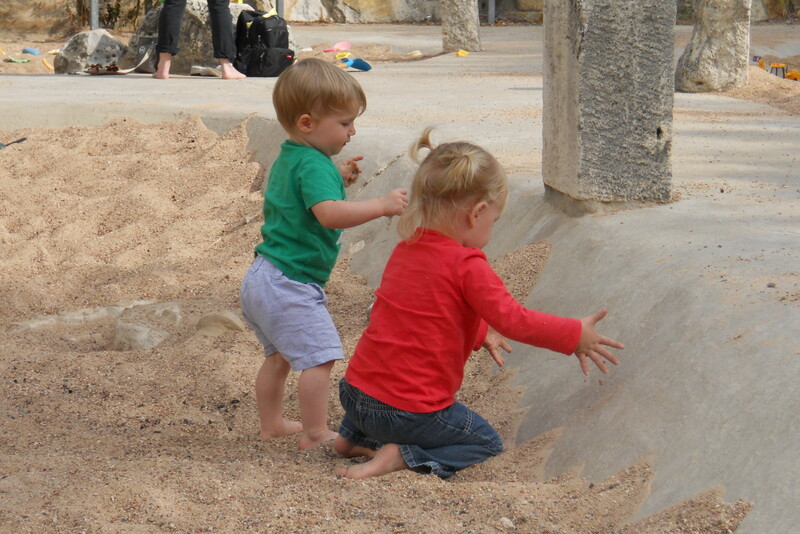 The kids’ favorite part came at the end – the Dino Pit. 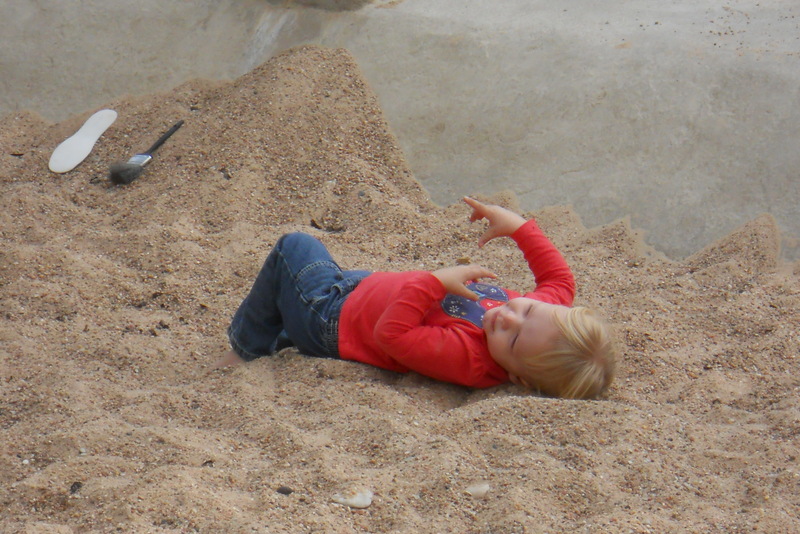 Basically, this is the world’s awesomest sand box. It is HUGE and full of shovels, brushes and fake dinosaur bones. 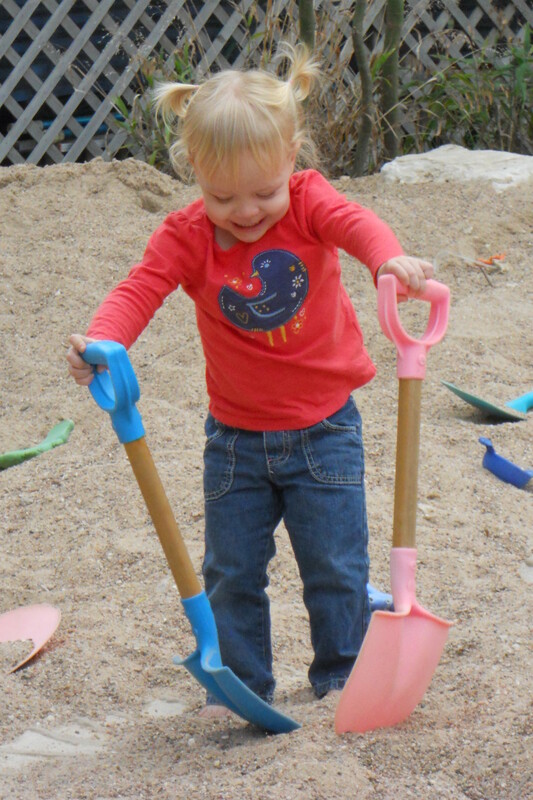 Let's wave our shovels and giggle! 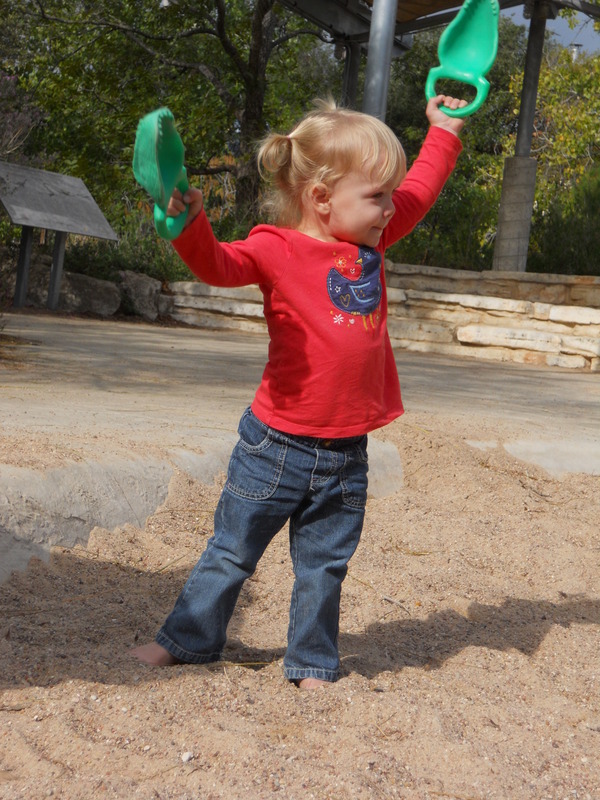 I could see that the Nature Center is going to be more fun when Hannah is older, but there was a lot she was able to enjoy now. And it’s all FREE! We were there for an hour and a half, so it was a fun morning activity in our (finally) fall weather. 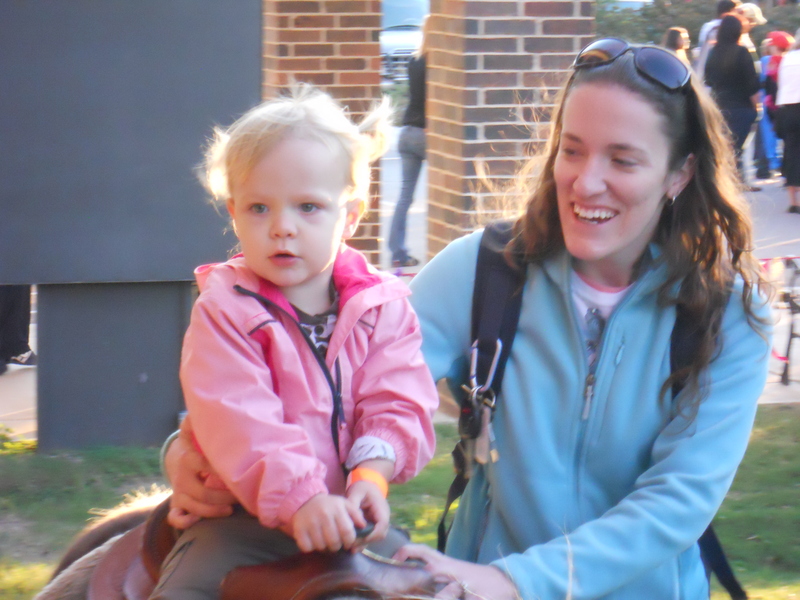 My cousin Jenny and her family who live in Austin are faithful supporters of pro-life activities. For the last several years, they have invited us to join their table at the annual Texas Alliance for Life dinner and program. This year, everything worked out and we were able to finally go! We finally found a babysitter we LOVE, so we left Hannah in her capable hands, dressed up and hit the town. The dinner was at the downtown Hilton, very nice. We were surprised how many people were there – almost 1500! We enjoyed meeting the others at the table, and the basil butter for the rolls was seriously tasty. There were many politicians there who all got introduced by name (with a special note if they are up for re-election). I was kind of interested in possibly seeing Rick Perry, but apparently he was off doing a debate or something. The speaker for the event was Lila Rose who is only 23 and started Live Action, a pro-life group geared toward teens and college students. As she said, with a growing national interest in social justice and human rights, more teens are identifying themselves as pro-life because they want to protect and speak out for the most vulnerable humans, the voiceless unborn. Lila Rose was introduced by Abby Johnson, a former Planned Parenthood director who became pro-life after watching an abortion on an ultrasound and having no doubt that was a baby fighting for its life. Texas was one of the first states to de-fund Planned Parenthood by prioritizing funding for groups that offer a wider range of medical services such as community health centers. They also announced a pro-life, pro-adoption license plate that will be released in November – you’ll be seeing one on my car, for sure! The pro-life “movement” is close to my heart because I am in a family of adoptees. My husband and my daughter, as unplanned pregnancies, would have been labeled by many as inconvenient, unwanted and disposable. I am thankful each day that their courageous birthmothers opted against what is culturally acceptable and chose life for the babies that are now my family. This morning we headed about 20 miles west to Dripping Springs for their Wild West Fest. They had kids’ activities, rodeo events, booths and food cook-offs for chili, salsa and pie. This is not a huge event, just enough to keep our little family entertained for just the right amount of time. And lunch! My Frito pie had homemade chili and queso, and Brett’s BBQ sandwich had been smoked right next to the concession booth. 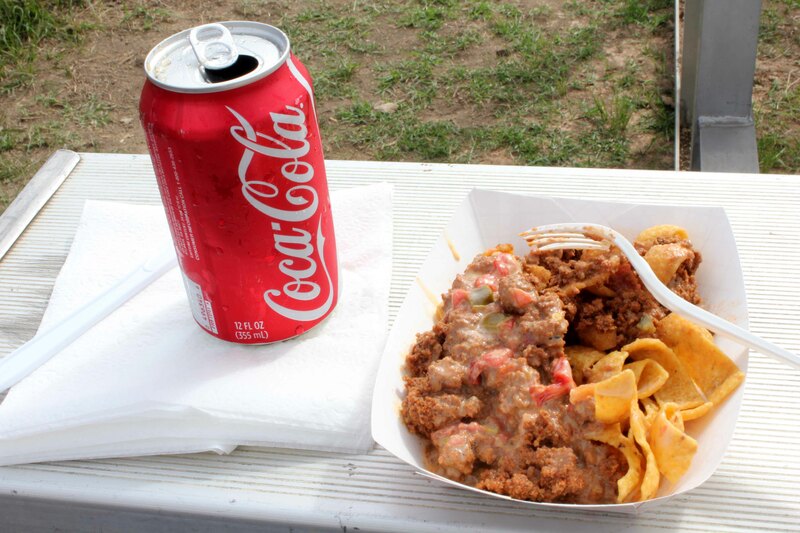 My lunch - Coke and Frito pie, soooo good! 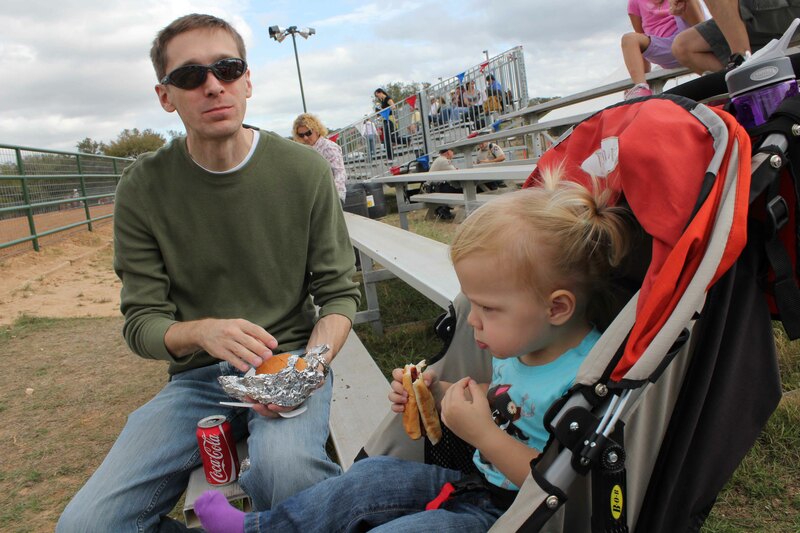 Brett had a BBQ sandwich and Hannah had a hot dog. We watched horse events while eating. 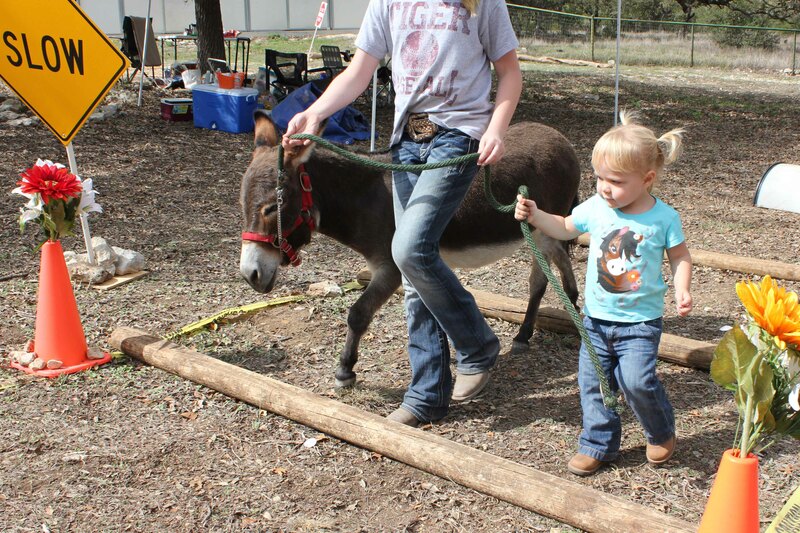 She got to "help" take the donkey on an obstacle course. 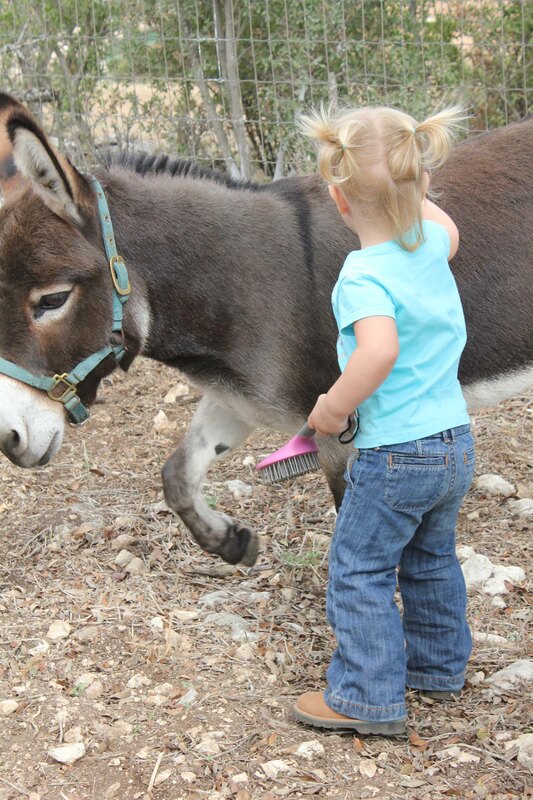 Time to brush the donkeys. 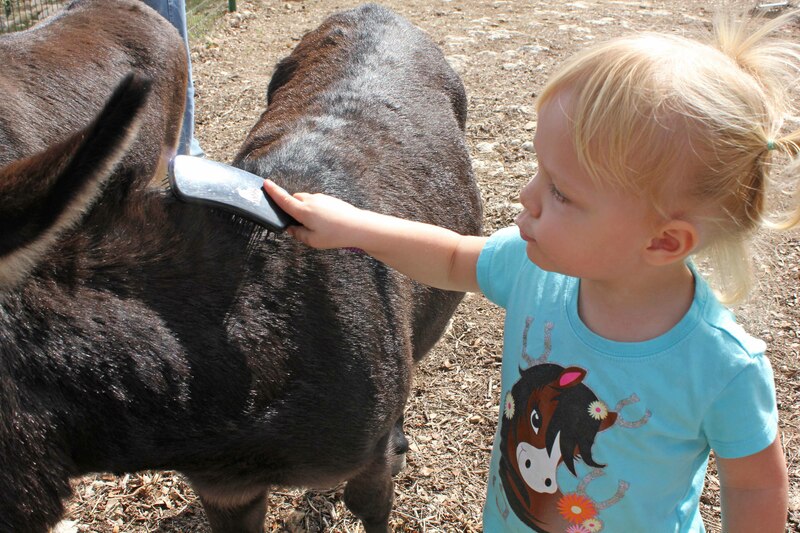 All the donkeys were so gentle and laid-back. 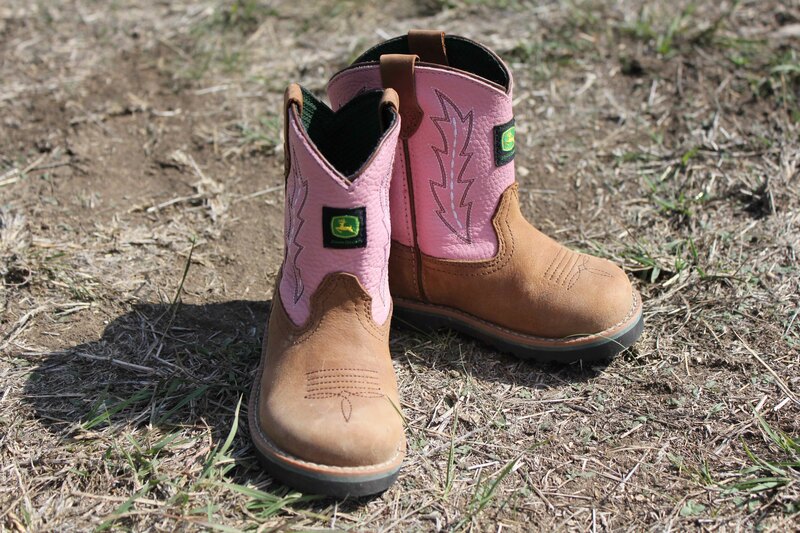 These little boots got some Texas dust on them today. This was a really fun family activity. Hannah loved seeing all the animals, and all the teenage girls who helped with everything (probably 4Hers) were so sweet with her. 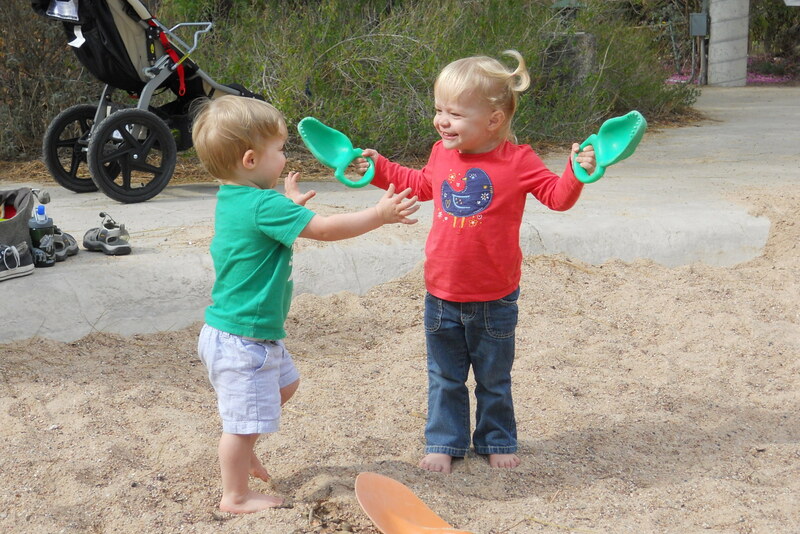 It was very affordable, too – parking, activities and lunch all totaled $20. I think we’ll put it on the calendar for next year, too. Sorry I’ve been slow in posting lately. Here are a few pictures from the last week to show what we’ve been up to. Grandma Joyce came to visit. 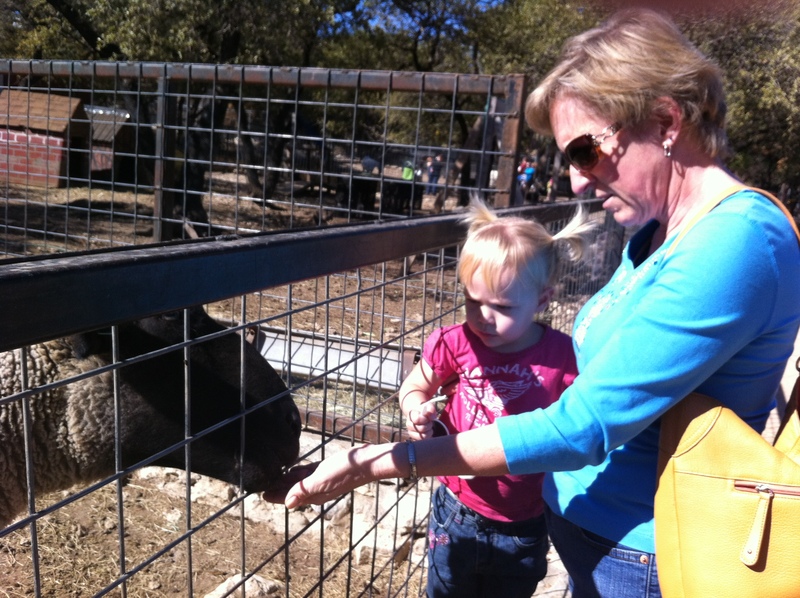 We went to the Austin Zoo and she showed Hannah how to feed the animals. 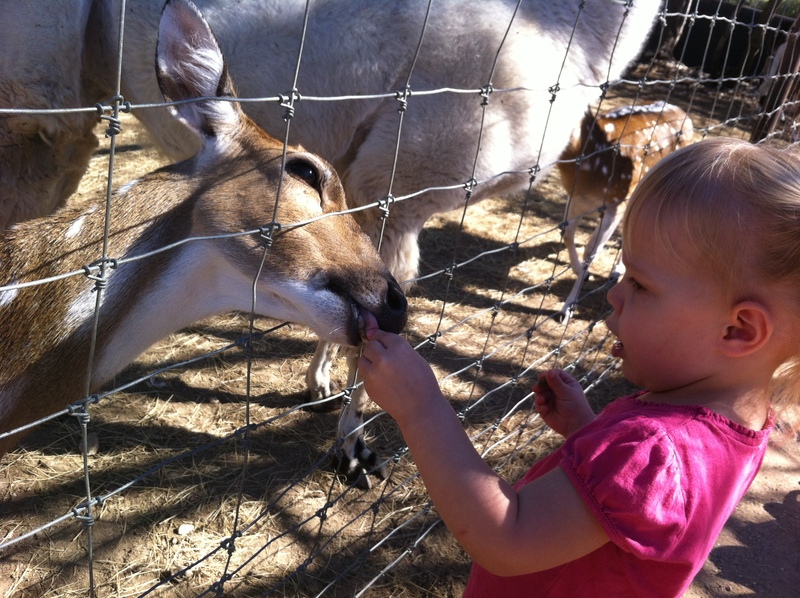 Then Hannah tried feeding the animals by herself. That was exciting! 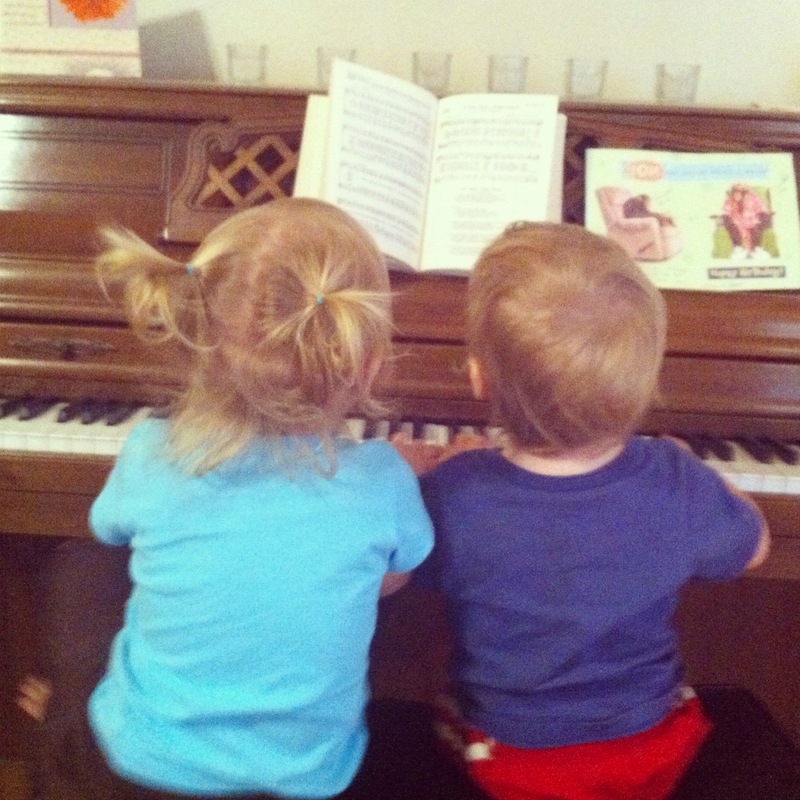 Hanging out with Cody, playing duets. 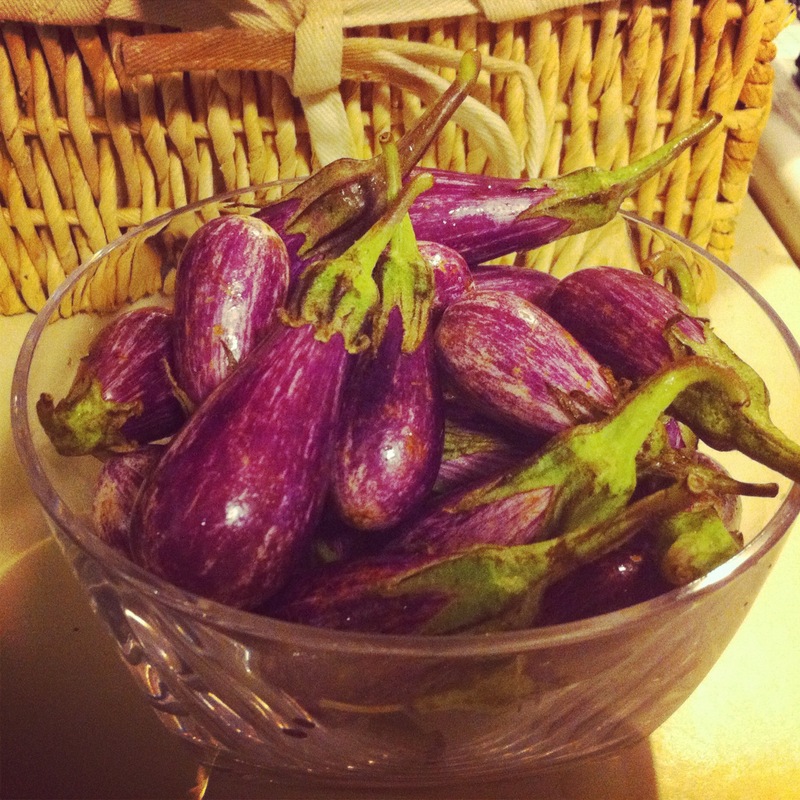 Beautiful eggplant from the farmer's market. Always value in looking at things from a different perspective. Cora wanted to take a picture of my hair. Random but I love it.